This White primed Climadoor shaker FrenchFold system is a uniquely designed white internal room divider door system. It provides central opening access like internal french doors, coupled with the benefit of internal bifold doors allowing the whole space to be opened up. This popular glazed shaker door design is offered in several opening sizes from 1684mm wide through to 2826mm, and is also available in pre-finished oak. 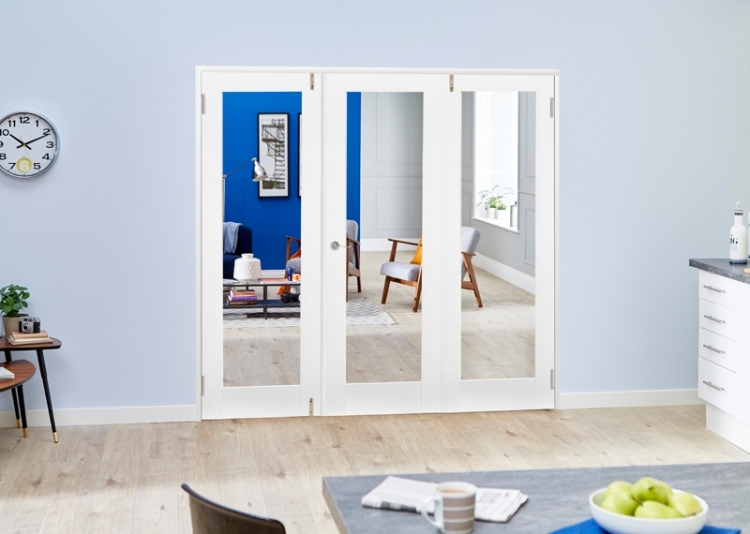 Choose from 3 and 4 door systems, which use 533mm, 573mm, 610mm and 686mm wide white primed internal doors. This makes installation simple as no planing of doors is required on site. When fully opened, these doors can fold back against the adjacent wall, maximising your opening space. The Climadoor white primed shaker room divider set comes with universal frame set, pivots, hinges, brushed stainless steel drop bolts and pre-glazed doors. Just add your own handle and latch! Please refer to our storage and decorating recommendations before installing the doors. All doors MUST be decorated before installation. These sets are standard joinery products, so can be adjusted in both height and width. The height can be reduced by up to 50mm, and the width can be reduced by 30-40mm. Unique design has both a central opening and folding ability. Engineered core improves thermal efficiency, strength, durability and value for money. White primed, ready for the top coat to be applied. Open, clear glazed panels allow maximum light flow. Please note that the frames for these sets are supplied unfinished as standard as they are universal.